Multi brand luxury boutique Verso and the Antwerp shoe boutique Coccodrillo teamed up for the COCCODRILLO for VERSO Shoe Salon which has opened at Verso, Antwerp for the fall/winter 2012 season. The space replaces Verso's Martini bar, with a dedicated storefront on the Lange Gasthuisstraat in the heart of Antwerp. Coccodrillo and Verso have united on this unique venture, recognizing a valuable brand synergy and a chance to explore a wider spectrum of new and established talents in shoe design. The formula is simple - the new space hosted by Verso will feature a glamorous selection of women's footwear labels selected in Paris and Milan by Coccodrillo’s Geert Bruloot & Eddy Michiels. The space will introduce exclusive new labels to Belgium, including the young star Burak Uyan, and Giorgio Armani's mainline collection. 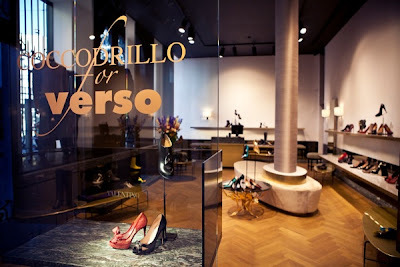 Existing Verso or Coccodrillo favorites like Dolce & Gabbana, Giuseppe Zanotti, Jil Sander, Salvatore Ferragamo, Valentino, Tod's and DSquared2 will be focused in a fresh new direction under Coccodrillo’s and Verso’s artistic eye. Designed by the Ghent-based architect Glenn Sestig, the 'salon-style' space features a sumptuous fusion of modern and art nouveau detailing, updating the grandeur of the Verso aesthetic with a touch of Coccodrillo minimalism. A central column extends as an island bench seat, and elliptical custom-made display tables surround the perimeter of the space.The extensive use of marble and warm green tones creates an environment of quiet luxury and quality in which the shoes become the natural centre of attention.